A set of fine Gujarati dishes at this vegetarian restaurant near Finchley Central. 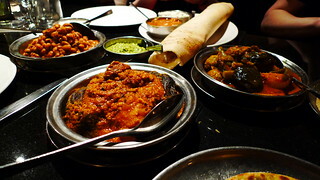 Pictured are undhia (centre, with baby aubergines, cauliflower, peas etc), akhaa ringal (right, aubergines whole with peanut stuffing), chola (left, black bean curry), and masala dosa (rear). At Rani Vegetarian, Long Lane.